Chisinau (KIV) — Iu. Gagarin Ave.
On the 18th (Thu), examine the collection at Shustov Cognac Winery Museum. On your second day here, see the interesting displays at Museum of Interesting Science, enjoy the sand and surf at Beach Golden Shore, and then see the interesting displays at Secrets of Underground Odessa Museum. To find more things to do, traveler tips, photos, and other tourist information, read Odessa trip itinerary planning site . Seattle, USA to Odessa is an approximately 20.5-hour flight. You can also do a combination of flight and train. Due to the time zone difference, you'll lose 10 hours traveling from Seattle to Odessa. In June, daytime highs in Odessa are 78°F, while nighttime lows are 62°F. Wrap up your sightseeing on the 20th (Sat) early enough to travel to Mukacheve. Mukachevo is a city located in the valley of the Latorica river in Zakarpattia Oblast, in Western Ukraine. Start off your visit on the 21st (Sun): take in the spiritual surroundings of St. Nicholas Monastery, pause for some serene contemplation at St. Joseph Chapel, pause for some serene contemplation at St.Martin Cathedral, then take in the architecture and atmosphere at Church of Pochaiv Madonna Icon, and finally step into the grandiose world of Palanok Castle. For traveler tips, other places to visit, ratings, and other tourist information, refer to the Mukacheve road trip planning tool . You can do a combination of flight and car from Odessa to Mukacheve in 8.5 hours. Other options are to do a combination of flight and train; or drive. Expect a bit cooler evenings in Mukacheve when traveling from Odessa in June, with lows around 56°F. 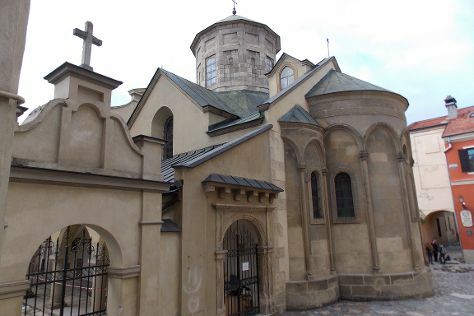 Finish up your sightseeing early on the 21st (Sun) so you can go by car to Lviv. 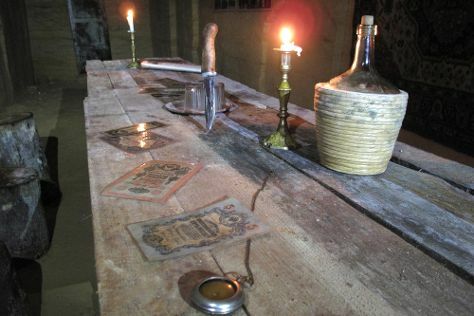 Let the collections at Armenian street and Insomnia - The Haunted House capture your imagination. Popular historic sites such as Armenian Virgin Mary's Dormition Church and Potoсki Palace are in your itinerary. There's much more to do: explore the world behind art at Museum of Folk Architecture and Life, examine the collection at Beer Cultural Experience Center “Lvivarnya”, make a trip to Chapel of the Boim Family, and contemplate in the serene atmosphere at Church of St. Andrew. To see photos, maps, other places to visit, and tourist information, use the Lviv road trip planner. Traveling by car from Mukacheve to Lviv takes 4 hours. Alternatively, you can take a train; or take a bus. When traveling from Mukacheve in June, plan for slightly colder days in Lviv, with highs around 73°F, while nights are about the same with lows around 54°F. Finish your sightseeing early on the 24th (Wed) so you can drive to Lutsk. Lutsk is a city on the Styr River in northwestern Ukraine. On the 25th (Thu), see the interesting displays at Museum of Volyn Icon, see the interesting displays at Lutsk Art Museum, explore the historical opulence of Lubart's Castle, then examine the collection at Books Museum, then take in the architecture and atmosphere at Pokrovska Church, and finally pause for some serene contemplation at Lutheran Church. On the 26th (Fri), you'll have a packed day of sightseeing: make a trip to Teatralnaya Square, pause for some photo ops at T.G. Shevchenko Monument, see the interesting displays at Technical Progress Museum, then see the interesting displays at Lutsk Skansen - People's Museum, and finally shop like a local with Art Gallery. For photos, ratings, where to stay, and more tourist information, go to the Lutsk trip builder website . You can drive from Lviv to Lutsk in 2.5 hours. Alternatively, you can take a train; or take a bus. In June, plan for daily highs up to 74°F, and evening lows to 54°F. Finish your sightseeing early on the 26th (Fri) so you can drive to Chernivtsi. 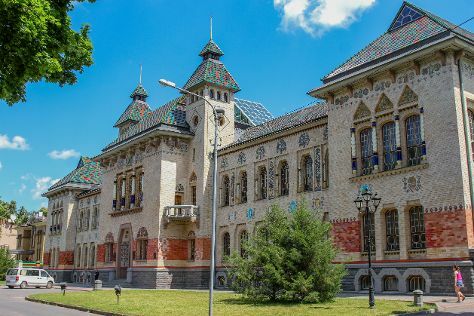 Chernivtsi is a city in western Ukraine, situated on the upper course of the River Prut. Get some historical perspective at Cathedral of the Assumption and St. Nicholas Wooden Church. Discover out-of-the-way places like Olha Kobylyahska Street and Bukovynian Diaspora Museum. There's lots more to do: take in the architecture and atmosphere at St Nicholas Cathedral, admire the striking features of Residence of Bukovynian Metropolitans - Chernivtsi National University, get engrossed in the history at Museum of Bukovinian Jewish History, and explore the world behind art at Chernivtsi Museum of Arts. For ratings, traveler tips, other places to visit, and other tourist information, refer to the Chernivtsi trip planner . Getting from Lutsk to Chernivtsi by car takes about 5 hours. Other options: take a bus; or take a train. In June in Chernivtsi, expect temperatures between 76°F during the day and 59°F at night. Cap off your sightseeing on the 29th (Mon) early enough to go by car to Kamianets-Podilskyi. Kamianets-Podilskyi is a city on the Smotrych River in western Ukraine, to the north-east of Chernivtsi. Discover out-of-the-way places like Khotyn Fortress and St. George Cathedral. Your inner history buff will appreciate Cathedral of the Saints Peter and Paul and Church of the Exaltation of the Cross. 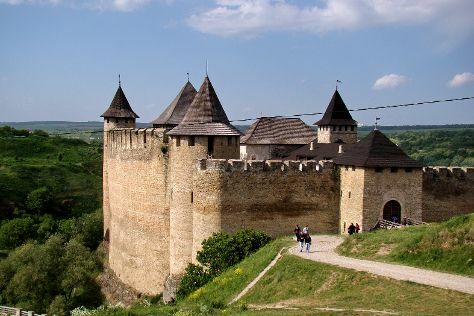 Step out of Kamianets-Podilskyi with an excursion to Khotyn Historic Museum in Khotyn--about 30 minutes away. There's lots more to do: pause for some serene contemplation at Church of Peter and Paul, explore the historical opulence of Kamenet's Podolsky Castle, see the interesting displays at Kamenetz-Podolskiy Historical Museum, and make a trip to Turkish Minaret. To see traveler tips, maps, photos, and more tourist information, go to the Kamianets-Podilskyi day trip planner . Drive from Chernivtsi to Kamianets-Podilskyi in 1.5 hours. Alternatively, you can take a bus; or take a train. In June, plan for daily highs up to 76°F, and evening lows to 59°F. Cap off your sightseeing on the 2nd (Thu) early enough to go by car to Vinnytsya. Vinnytsia is a city in west-central Ukraine, located on the banks of the Southern Bug.It is the administrative center of Vinnytsia Oblast and the largest city in the historic region of Podillia. Kick off your visit on the 3rd (Fri): take in the architecture and atmosphere at Holy Transfiguration Cathedral, take in the spiritual surroundings of Jesuit Monastery, then examine the collection at Museum of Retro Technology Avtomotovelofotoradio, then see the interesting displays at Pirogov's Masoleum - St.Nicolas Church, and finally examine the collection at National Pirogov's Estate Museum. Keep things going the next day: get curious at Science Museum, then examine the collection at Vinnytsya Regional Lore Museum, then get engrossed in the history at Ukrainian Philatelic Museum of Jakiw Balaban, and finally explore the world behind art at Vinnytsya Museum of Art. To see where to stay, maps, more things to do, and more tourist information, use the Vinnytsya travel itinerary planner. You can drive from Kamianets-Podilskyi to Vinnytsya in 3 hours. Other options are to take a bus; or take a train. Finish your sightseeing early on the 4th (Sat) so you can travel to Poltava. Popular historic sites such as Savior Church and St. Panteleimon Church are in your itinerary. The Poltava Museum of Local Lore and The Poltava Battle History Museum are good opportunities to explore the local culture. Explore Poltava's surroundings by going to Museum of Ukrainian Pottery (in Opishnya) and National Museum of Nikolai Gogol (in Gogolevo). To see traveler tips, reviews, ratings, and other tourist information, read Poltava online trip builder . Getting from Vinnytsya to Poltava by combination of flight, shuttle, and train takes about 6.5 hours. Other options: take a train; or drive. Finish your sightseeing early on the 7th (Tue) to allow enough time to drive to Chernihiv. Chernihiv HistoryChernihiv was first mentioned in the Rus'-Byzantine Treaty (907) (as Черниговъ (Chernigov)), but the time of establishment is not known. Get some cultural insight at Dytynets and Saviour-Transfiguration Cathedral. Museum-lovers will appreciate Chernihiv Regional Art Museum and Tarnovskiy Regional Historical Museum. Next up on the itinerary: pause for some serene contemplation at Pyatnytska Church, appreciate the history behind Taras Shevchenko Monument in Dytynets, take in the spiritual surroundings of Yeletsky Assumption Monastery, and steep yourself in history at Chernihiv Collegium. To see ratings, traveler tips, photos, and more tourist information, go to the Chernihiv trip planner. You can drive from Poltava to Chernihiv in 5.5 hours. Alternatively, you can take a train; or take a bus. Finish your sightseeing early on the 10th (Fri) to allow enough time to drive to Kiev. Your inner history buff will appreciate Saint Sophia Cathedral and Kiev-Pechersk Lavra - Caves Monastery. Get some cultural insight at Mezhyhirya Residence Museum and St. Michael's Golden-Domed Monastery. There's lots more to do: see the interesting displays at State Aviation Museum, brush up on your military savvy at Great Patriotic War Museum, take in the pleasant sights at Sofiyskaya Square, and capture your vacation like a pro with an inspiring photography tour. To find traveler tips, where to stay, other places to visit, and more tourist information, read our Kiev online sightseeing planner . You can drive from Chernihiv to Kiev in 2 hours. Other options are to take a bus; or take a train. In July in Kiev, expect temperatures between 80°F during the day and 61°F at night. Finish your sightseeing early on the 14th (Tue) so you can travel back home.